by U.S. House of Representatives. July 27, 2011. To provide for the establishment of the Special Envoy to Promote Religious Freedom of Religious Minorities in the Near East and South Central Asia. SECTION 1. SPECIAL ENVOY TO PROMOTE RELIGIOUS FREEDOM OF RELIGIOUS MINORITIES IN THE NEAR EAST AND SOUTH CENTRAL ASIA. 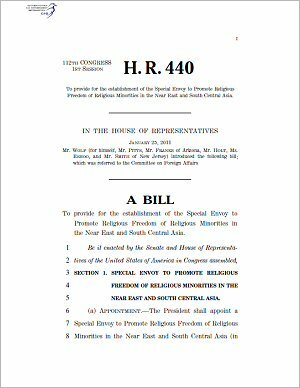 (a) Appointment- The President shall appoint a Special Envoy to Promote Religious Freedom of Religious Minorities in the Near East and South Central Asia (in this Act referred to as the `Special Envoy') within the Department of State. (b) Qualifications- The Special Envoy should be a person of recognized distinction in the field of human rights and religious freedom who shall have the rank of ambassador and shall hold the office at the pleasure of the President. (1) Promote the right of religious freedom of religious minorities in the countries of the Near East and the countries of South Central Asia, denounce the violation of such right, and recommend appropriate responses by the United States Government when such right is violated. (2) Monitor and combat acts of religious intolerance and incitement targeted against religious minorities in the countries of the Near East and the countries of South Central Asia. (3) Work to ensure that the unique needs of religious minority communities in the countries of the Near East and the countries of South Central Asia are addressed, including the economic and security needs of such communities. (4) Work with foreign governments of the countries of the Near East and the countries of South Central Asia to address laws that are inherently discriminatory toward religious minority communities in such countries. (5) Coordinate and assist in the preparation of that portion of the report required by sections 116(d) and 502B(b) of the Foreign Assistance Act of 1961 (22 U.S.C. 2151n(d) and 2304(b)) relating to the nature and extent of religious freedom of religious minorities in the countries of the Near East and the countries of South Central Asia. (6) Coordinate and assist in the preparation of that portion of the report required by section 102(b) of the International Religious Freedom Act of 1998 (22 U.S.C. 6412(b)) relating to the nature and extent of religious freedom of religious minorities in the countries of the Near East and the countries of South Central Asia. (b) Coordination- In carrying out the duties under subsection (a), the Special Envoy shall, to the maximum extent practicable, coordinate with the Bureau of Population, Refugees and Migration of the Department of State, the Ambassador at Large for International Religious Freedom, the United States Commission on International Religious Freedom, and other relevant Federal agencies and officials. (2) multilateral conferences and meetings relevant to religious freedom in the countries of the Near East and the countries of South Central Asia. The Special Envoy shall consult with domestic and international nongovernmental organizations and multilateral organizations and institutions, as the Special Envoy considers appropriate to fulfill the purposes of this Act. Of the amounts made available for `Diplomatic and Consular Programs' for fiscal years 2011 through 2015, the Secretary of State shall provide to the Special Envoy $1,000,000 for each such fiscal year for the hiring of staff, for the conduct of investigations, and for necessary travel to carry out the provisions of this Act. (2) the term `South Central Asia' or `countries of South Central Asia' means Afghanistan, Bangladesh, Bhutan, India, Kyrgyzstan, Kazakhstan, Maldives, Nepal, Pakistan, Sri Lanka, Tajikistan, Turkmenistan, and Uzbekistan.